More than 200 trainee engineers will be hired across the West Midlands - of which 20 will be based in Staffordshire - as part of the largest recruitment drive ever undertaken by Openreach. The 20 roles, part of 3,500 available across the UK during the next 12 months, will be located in Abbots Bromley, Kinver and Stafford. Openreach has also announced plans to invest about £100,000 over the next 12 months developing a new fibre engineering academy at its Yarnfield Park training centre, near Stone, in addition to the pole forest, underground cable chambers and other existing facilities at the site. 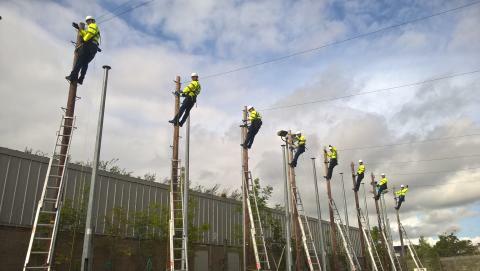 The new trainees will join the UK’s largest team of telecoms engineers working to expand, upgrade, maintain and install new services over Openreach’s national broadband network. Richard Hall, infrastructure delivery director for Openreach in the West Midlands, said: “This latest recruitment represents a further major investment in the region. It’s very exciting news for our region. We’re looking forward to men and women from all walks of life applying for these roles at Openreach as we’re keen to engage with the aspiring engineers of tomorrow and to build a diverse workforce that reflects the hugely diverse communities we serve.